March winds bring April showers, and also the latest and greatest version of Firefox! Let’s take a look at some of the new goodies and other changes in the browser. If you have tabs open in Firefox on another device, those tabs will now appear as suggestions in the Awesome Bar. It’s a fast way to pick up where you left off on your phone or work computer. You can also view the full list of tabs open on other devices via a toolbar button menu. You’ve been able to filter network requests by URL since Firefox 40, but now you’re able to filter out requests you’re not interested in by pre-pending ‘-‘ to your filter terms. Handy in long-lived single-page webapps where many requests occur over the duration of a page session. The animation panel has a few new tricks up its sleeve (sleeves? not sure how many limbs a devtool has). You can now view a list of individual properties being modified by each animation. The expanded view of the timeline also has markers for each keyframe that applies to the specific CSS property. Also new in Firefox 45 is the ability to adjust the playback rate in the Animation Panel for fine-tuning those complex sequences in slow motion. Should speed up debugging quite a bit. Get hip to the animation inspector’s capabilities on MDN. Hello Tab Groups! 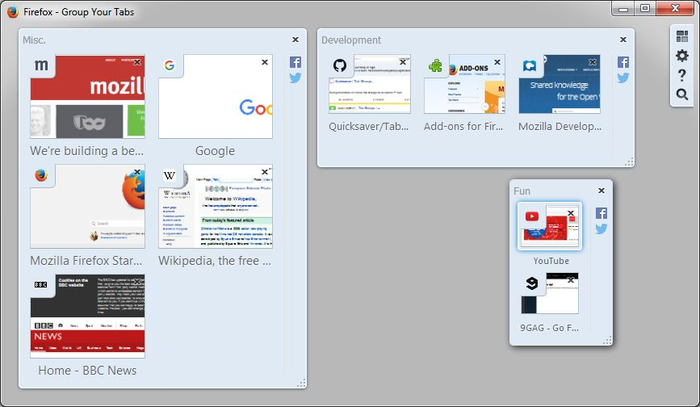 If you know about the Tab Groups feature in Firefox, there’s a pretty good chance you are a die-hard power user of the feature. That group, however, was a very small percentage of users, and the feature was removed to simplify Firefox’s code base. Never fear! Simultaneously, add-on developer Quicksaver stepped up and hosted the Tab Groups code into a Firefox extension! All the visual organizing, drag-n-dropping action is just as it was before. Kudos to Quicksaver for keeping the power-user dream alive! Read more about the removal of Tab Groups, and how to restore your old groups using the extension. There’s always more to talk about in a Firefox release than I have words for, and 45 is no exception. Check out the release notes for a high-level list of changes in the browser, or peruse the detailed list of developer facing changes on MDN.